Grab, the leading O2O mobile platform in Southeast Asia, today launched the #JelajahIndonesiaLebihDekat (#ExploreIndonesiaCloser) campaign, in partnership with Ministry of Tourism of the Republic of Indonesia. Jakarta, 26 October 2018 – Grab, the leading O2O mobile platform in Southeast Asia, today launched the #JelajahIndonesiaLebihDekat (#ExploreIndonesiaCloser) campaign, in partnership with Ministry of Tourism of the Republic of Indonesia. As the government’s mobile platform partner, Grab will provide safe and convenient travel to 17 million foreign tourists this year, and promote the country’s top tourism destinations to more than 125 million Grab users in 8 countries in Southeast Asia. This follows the memorandum of understanding between Grab and the Ministry of Tourism that was signed last September, to introduce Smart Tourism in support of the ‘Wonderful Indonesia’ campaign. The launch event was held at Soekarno-Hatta International Airport, the country’s entry gateway for inbound tourists, and attended by Arief Yahya, Minister of Tourism Republic of Indonesia; Priyantoro Rudito, Chairman II Co-branding Team Ministry of Tourism Republic of Indonesia; Ridzki Kramadibrata, Managing Director of Grab Indonesia and Muhammad Awaluddin, President Director of PT Angkasapura II, as well as strategic tourism partners. “Digital advances play an important role to promote our tourism sector. 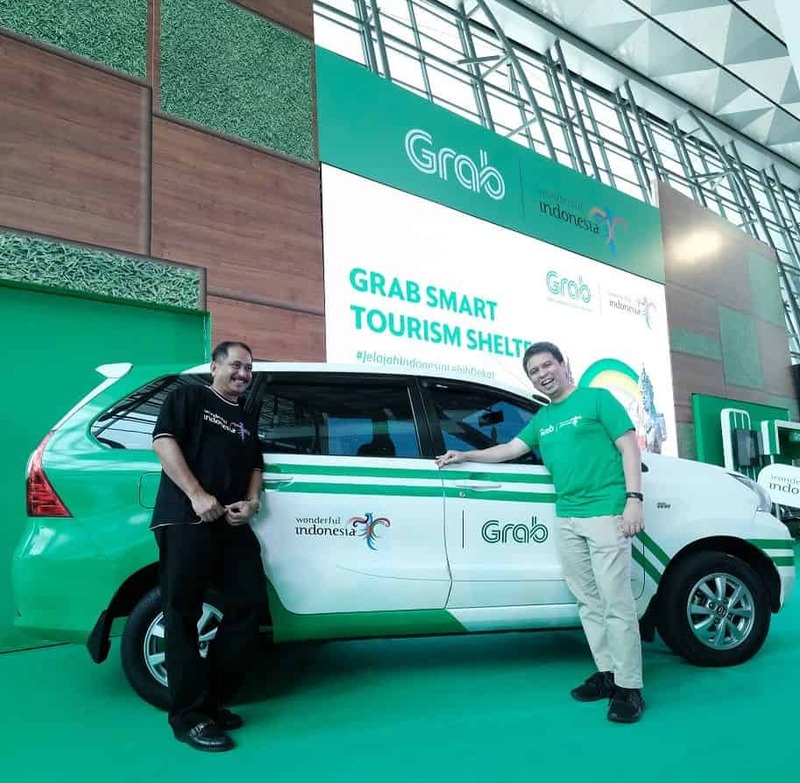 Therefore, we are delighted to partner with Grab on our Smart Tourism strategy for the ‘Wonderful Indonesia’ campaign , and provide a seamless digital experience for tourists at our airports and leading destinations in Indonesia. We hope this collaboration will help us realise our target to bring in 17 million international tourists this year and 20 million international tourists in 2019,” said Arief Yahya, Minister of Tourism Republic of Indonesia. “We are grateful for the Ministry of Tourism’s trust and support towards Grab, and are honoured to play our role to showcase the best of Indonesia to tourists and offer an easy travel experience. As proud sponsors of this year’s Asian Games, we’ve seen first-hand how Indonesian hospitality impresses visitors to our country, and we look forward to doing even more to improve the tourist experience with easy transport, local recommendations and other tourist perks. The strategic partnership with the Ministry of Tourism of The Republic of Indonesia highlights Grab’s commitment for Indonesia and is an extension of our ‘Grab 4 Indonesia’ master plan 2020,” said Ridzki Kramadibrata, Managing Director, Grab Indonesia. In support of the ‘Wonderful Indonesia’ campaign, Grab will offer ‘Smart Tourism’ initiatives to provide a more value-added experience for millions of domestic and foreign tourists. Tourists can Rent a GrabCar if they prefer to book a car for a few hours, so that they can travel easily to and from famous tourist destinations. The Rent service is available in Jakarta, Bandung, Yogyakarta, Bali, Surabaya, Manado and Makassar. Airport (Jakarta), Husein Sastranegara International Airport (Bandung), and Sultan Mahmud Badaruddin II International Airport (Palembang). The GrabChat feature (Grab’s in-app instant messaging) helps to reduce any language barriers by automatically translating messages sent between users and driver-partners. Selected Rent a GrabCar drivers will receive training to be tour guides, and will obtain ‘Wonderful Indonesia’ certification from the Ministry of Tourists can now enjoy safe and convenient rides while learning more about the rich culture and heritage of Indonesia from certified driver-partners. Grab provides the widest range of services in Southeast Asia, spanning 235 cities across 8 countries, with more than 125 million users. In Indonesia, Grab operates in 137 cities from Sabang to Merauke. In line with its everyday superapp vision and open platform strategy, Grab currently provides a variety of services to meet the daily needs of Indonesian, ranging from two-wheeled and four-wheeled transportation services, courier service, digital payments, to food, goods, and groceries delivery services.